Electromagnetic waves can propagate through cylindrical waveguides. 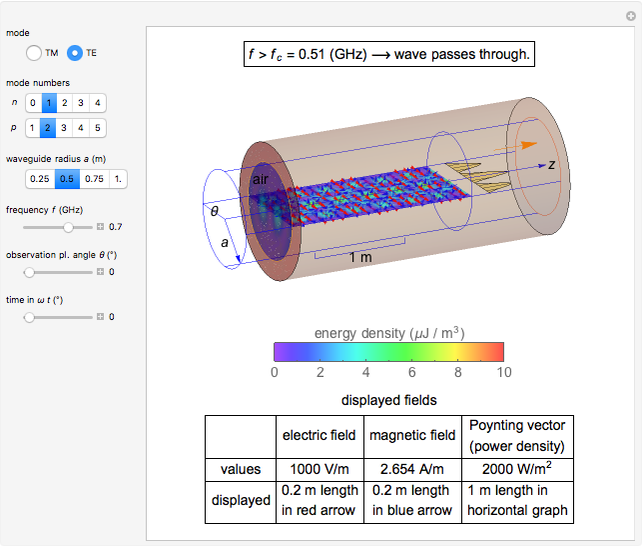 This Demonstration shows the associated fields, energy distributions, and energy transport. These waveguides support transverse magnetic (TM) and transverse electric (TE) modes. Given the mode numbers , radius , and frequency , the instantaneous fields and energy density distribution are displayed for the designated time on the plane with angle through the cylindrical axis. The maximum electric field is fixed at 1000 V/m for all cases. The frequency has to be higher than the cut-off frequency , which is determined by and the mode numbers. Using cylindrical coordinates and taking the wave propagation direction as the axis, the fields are a function of , , , and . The energy flows along the channel in the positive direction. The electric and magnetic fields are shown by the red and blue arrows, respectively. The energy density is displayed by varying colors. The energy transport or power density is equal to the averaged Poynting vector, whose magnitude depends on and ; it is shown by the curve in the observation plane on the right. The fields are described in the table. The constant is purely imaginary if the frequency is higher than a certain value, the cut-off frequency. The propagation constant and the cut-off frequency are not the same for TM and TE modes. The energy density can be calculated by , and being the instantaneous field values. The average Poynting vector is given by , which is always in the direction. 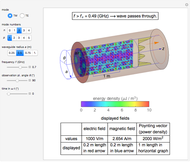 It is possible to select a frequency below the cut-off value, in which case the energy density is no longer periodic along the axis, and the Poynting vector is zero. D. K. Cheng, Field and Wave Electromagnetics, 2nd ed., New York: Addison-Wesley, 1989. Y. Shibuya "Electromagnetic Waves in a Cylindrical Waveguide"